Managed to get my hands on tomorrow’s newspaper before it went to print. Interesting front page headline! I’ve had to reduce the size here to fit it in our site’s narrow table but you can click the thumbnail to enlarge it if you can’t read it clearly! Mobile games running off UE must be amazing successes in gameplay and sales if he can ignore even older UE platforms on Nintendo machinery. OH, and great find, RAB. You really beat those news aggregators to the punch. Cheers for fixing up the image for me Pro. At 2am or whenever I posted it I wasn’t thinking clearly. 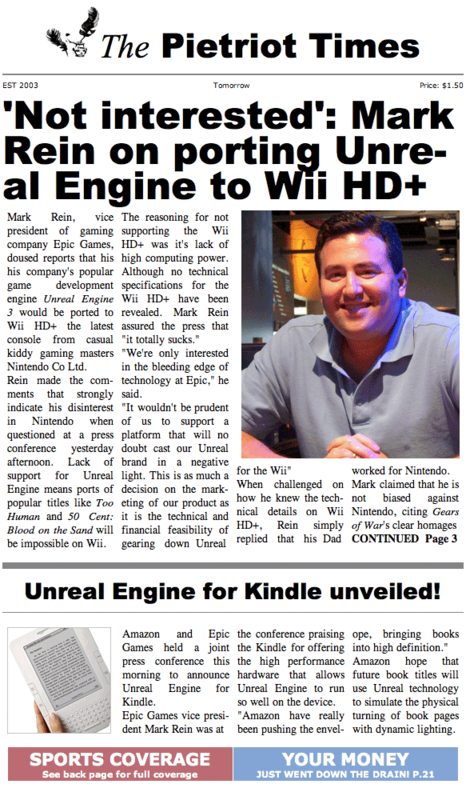 ALSO on page three it went on to talk about the clear-as-day homages to Super Mario Bros found in Gears of War. It really is quality work, too bad it’s posted here where no one will see it. I love where it finishes on. Classy.